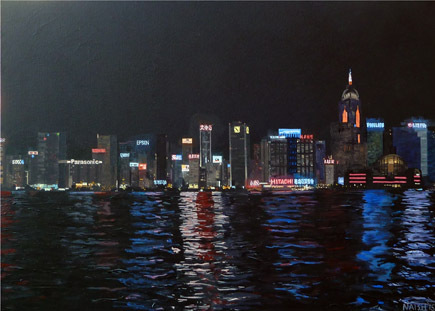 So, here is the final painting for the Urban and Rural exhibition. The original idea for the exhibition was to complete ten different Urban images and ten different rural ones. I composed all images some weeks previously and just re-visited each image in order as it was time to paint them. Although I liked this “slave to randomness” the final urban wall felt slightly unbalanced in a narrative sense. There were two representatives from Luton and two from Hong Kong. The uncompleted second row would have contained two London images and a Liverpool liver building in the mist piece (I may return to these at some future time). If I were asked to convey “Urban”, I would have liked to included some of the second row images. It is under this slight misgiving that I painted this piece. It was always a bit of a challenge using both daytime reference and night-time to understand the real shapes hiding in the darkness. I also visited google to add some semi-made up logos. I was slightly rushing towards the end and never felt I quite found a consistent approach to the blur levels of the signage and lights. It is an image I wanted to paint for a while and yet I feel know link between this desire and the finished paintings. Maybe it needed more development time to discover which aspect of the skyline I wanted to portray. I do however enjoy the way different paint colours vary between matt and gloss. This means the burnt umber in the buildings tend towards a matt look while other areas are more gloss. Not a euphoric conclusion to my “Urban and Rural” adventure but certainly a relief to have achieved so much. This was concluded just less than one week to the exhibition, with just enough time to paint sign-boards and print labels and graphics.